German philologist and archeologist; born Aug. 18, 1803, at Cassel; died about 1843. His father was paymaster of the army. In 1816 he entered the lyceum at Cassel, and in 1821 went to the University of Marburg, where he devoted himself chiefly to philology and archeology, continuing these studies for a year at Heidelberg. Forced by poverty to leave the university, he went, with letters of introduction from the historian Schlosser, to Frankfort-on-the-Main. Here he taught for two years at the institute of Dr. Weil, and then acted as private tutor. He took his Ph. D. degree in 1823 with the dissertation "De Senatu Romano," part i. In the fall of 1827 he obtained the "venia legendi." During his short life Hoffa displayed a many-sided literary activity, being equally at home in classical, French, and English literature. He published chiefly manuals and text-books, including the following: "Des C. Plinius' Lobrede auf den Kaiser Traian," from the Latin, with introduction and notes, Marburg, 1834; "Qu. Ciceronis de Petitione Consulatus ad M. Tullium Fratrem Liber . 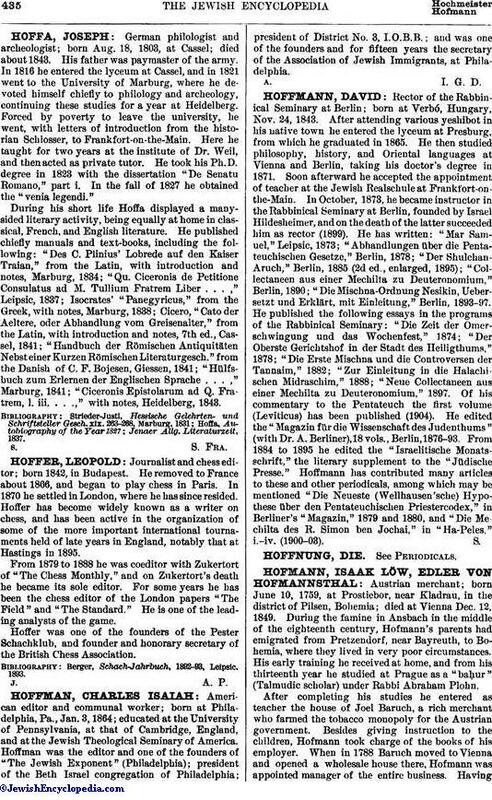 . . ," Leipsic, 1837; Isocrates' "Panegyricus," from the Greek, with notes, Marburg, 1838; Cicero, "Cato der Aeltere, oder Abhandlung vom Greisenalter," from the Latin, with introduction and notes, 7th ed., Cassel, 1841; "Handbuch der Römischen Antiquitäten Nebst einer Kurzen Römischen Literaturgesch." from the Danish of C. F. Bojesen, Giessen, 1841; "Hülfsbuch zum Erlernen der Englischen Sprache . . . ," Marburg, 1841; "Ciceronis Epistolarum ad Q. Fratrem, 1. iii. . . .," with notes, Heidelberg, 1843.